What part of the word “Forever” do we no Longer Understand? On the third day of April 1969 the temporal concept of “forever” was astonishingly and arbitrarily quantified by Pope Paul VI — much to the perplexity of historians and physicists — as 399 years— or to be precise, 399 years, 9 months, and 11 days. However — and this is vital to understand — it is the inescapable logical consequence of replacing the Apostolic Constitution Quo Primum — which unambiguously states that the Tridentine Mass (as we have come to call it) is, and always will be, the only valid Mass, incapable of being altered, modified, or changed in any way by any person whomsoever — “henceforth, now, and forever”. But this unalterable Mass had, in fact, been superseded by the Novus Ordo Missae (New Order Mass) following Vatican II, despite the fact that Quo Primum was to be in force “forever” and in no way “altered”. What was decreed to remain both unalterable and forever … was neither, following Vatican II. We were left asking ourselves what, in fact, the word “forever” had suddenly come to mean, together with all the ramifications of this re-definition of a clearly understood concept. In other words, if “forever” does not mean “for all time and into eternity” … what, precisely does it mean? If what is held to be “forever” is abrogated in its intension by the introduction of something that re-defines it in such a way that it is nullified. Why is that? Simply put, anything “other than” our understanding of the intensionality of “forever” eo ipso nullifies it, for it must be less and cannot be greater than “forever” as we had always understood the concept “forever”— and what is less is already understood in other temporal terms, in which case the re-definition of “forever” becomes merely redundant of other and already existing temporal concepts such as “now”, “past”, “present”, and “future”. In other words, if “forever” is in any way abbreviated to something less, then it is determinate and if it is determinate it is quantifiable. In the present case it is reduced to 399 years, 9 months, and 11 days, or the period between Quo Primum (the Latin Mass) in 1570 and its being superseded by Missale Romanum (Mass in the vernacular) in 1969. What was deemed as binding “forever” in 1570 and the following 400 years was breached by something new (novus) and different in 1969. But how is this possible if what was binding “now, henceforth, and forever” in 1570 was replaced in 1969? How could “forever” come to mean, “only in force for 400 years — after which it is susceptible to being abrogated”? Logically such a breach cannot occur without somehow re-defining the concept of “forever”. But this is fraught with inconsistencies and contradictions that make any effort of the sort possible. Consider the following verse: “I am the living bread that came down out of Heaven; if anyone eats of this bread, he shall live forever” (St. John 6.51) What do we understand by this? That those who “eat of this bread” shall live for 399 years, 9 months, and 11 days? Of course not. We understand that they shall live forever, which is to say, for all time into eternity. The word “forever” or “for ever” occurs 472 times in Holy Scripture and it is always spoken of or understood in terms of limitless perpetuity, e.g. “for his mercy endureth forever.” (Ps. 135.20) By what possible warrant can we understand God’s mercy as enduring for a finite quantum of time, say, 160 years, 6 months and two days? In other words, how do we quantify forever? We cannot. It is not a quantifiable sum. When Saint Paul says of Christ: “Jesus Christ, yesterday, and today; and the same forever”, how are we to hold “yesterday” as meaning, “the day before this present day”, and “today” as “this present day” — but “forever” as meaning “399 years, 9 months, and 11 days”? After that limited duration of time does Christ become something different? Why did Saint Paul not say “Jesus Christ, yesterday, and today; and for 399 years, 9 months, and 11 days”? In other words, does the word “forever” in Sacred Scripture, and in ordinary discourse, mean something different than it meant in Quo Primum, and if it does, why just Quo Primum? If we re-define the concept of “forever” it must apply to each and every iteration of it, wherever it occurs, sacred or profane. Are we prepared to do this? Is it even logically possible? In a word, no. Moreover, we must then ask, what then is the periodicity of the concept “forever” once it acquires a terminus, an end — and what is more, and of far greater importance, what lies beyond it? If it is merely the most extensive temporal concept in an array of other lesser, but equally determinate temporal concepts, then its durability is finite — notwithstanding that the notion of time itself is indefinite (for being discretely, and however arbitrarily enumerated, it is at least conceptually infinite by mere addition). As Saint Augustine pointed out in broaching the concept of eternity (in which there is no time as we understand it) it is pointless to ask “what preceded eternity?” for the notion of precedence is itself a temporal notion, and to ask “what preceded eternity?” (in which there is no time) is to ask “what preceded time before there was no time.” We are now asking, “what succeeds forever when “forever” as a determinate time frame expires?” What do we call it? Can we concatenate a series of “forevers” indefinitely? And if we do, what shall we call it? Forever? We cannot — for “forever”, as we had said, has become a determinate time frame following the Apostolic Constitution Missale Romanum of Vatican II. Perhaps you begin to see the inconsistency, the absurdity really, of tampering with the notion of “forever”. Even if we argue that the Pope has the authority and the ability to re-define and abbreviate the notion of “forever” by invoking Christ’s pronouncement to Saint Peter: “Whatever you bind on earth is bound in Heaven” (St. Mat. 18.18), we still have not circumvented the problem. Heaven itself is the paradigm par excellence of “forever” (and so, too, is Hell). Time and logic are not in the arena of “Faith and Morals” in which alone the Pope is competent and infallible. (Nor, incidentally is economics). Even if a pope repeals a former pope’s Apostolic Constitution, he cannot repeal logic nor re-define the intensionality of a concept, in this case “forever”. To say that St. Pius V did not “intend” to use “forever” in the way we, and all our predecessors understood it, is absolutely without warrant or justification. 1 He meant that The Apostolic Constitution Quo Primum would be binding forever. If not, why the severest admonition at the end of Quo Primum? Since Vatican II, however, “forever”, it appears, has a terminus after all ... and does not mean ... well ... forever … at least in the reinterpreted and novel concept of time enunciated by Pope Paul VI in his Apostolic Constitution Missale Romanum — which abolished, or more properly expurgated the notion of “forever” to accommodate changes that could not be reconciled with that concept. Quo Primum leaves absolutely no room for ambiguity as you will see in the document itself which accompanies this article. If the proposal on the table is in open conflict with the concept of “forever”, then one must go: the proposal or “forever”. Paul VI opted for the latter. It must either be redefined or abolished. He did both. From a purely philosophical point of view, this quantification of the temporal category that we understand as “forever” poses not simply significant, but insuperable problems in any discussion concerning the nature of any conceivable temporal discourse. Let us look at a few instances. “Never” does not mean “at no time” — either in the past, the present or the future. Altering the connotation or intension of any of these five categories (forever, never, now, before, past — but especially “forever”), not simply alters, but abolishes the connotation or meaning of each and all of them. FIRST / last, second, third, etc. (i.e. a series) — also, minute, hour, day, week, month, year, decade, century, millennium, etc. As we see, quite a bit follows from “forever” no longer being understood as forever but rather, as 399 years at which time “forever” expires. We must understand that the term “forever” subsumes all the temporal categories and inflections under it, all of which are determinate and finite extensions of time relative only to “forever” (for all time and into eternity) which had erstwhile been understood as indefinite and indeterminate — as so many parts, or segments, if you will, of an infinitely extensive concept (forever) that is indeterminate by definition. In a word, if “forever” is arbitrarily determined as a finite quantum, all that it subsumed beneath it and understood relative to it is also susceptible to arbitrary determination and we can no longer coherently enter into temporal discourse of any kind that presumes to bind any state of affairs to a determinate referent in time. A week, or month, for example, is only what we arbitrarily understand it to be according to our purpose at hand. The implications of “implicitly” redefining the temporal concept of “forever” are enormous. Think of it. They pertain, according to the canons of reason, not only to the simplest geometric concept of a line (“A line has only one dimension: length. It continues forever in two directions.”), but to the trajectory, and ultimately, the destiny of the human soul according to the most fundamental notions of Christian doctrine: the eternity of God and the immortality of the soul. Let us look at this more closely. If, by a pure fiat, we are no longer to understand “now" as “the present moment", but a duration of “3 minutes and 27 seconds” — what follows? Indeed, can we even ask the question, “what follows?” since “following” is a temporal concept meaning “occurring after the present moment, or “now”. What happened in the intervening “3-minutes-27-seconds”? How do we understand that 3-minutes-27-seconds vacuum? We cannot say that it did not exist, or that what occurred within it did not occur — nor is it possible that nothing occurred within it. Such an assertion accords with neither reason nor experience. In the 3-minutes-27-seconds that intervenes between the present now and the next now (3-minutes-27-seconds later) what do we say of what we did or what had happened in that time frame? Whatever it was, it did not occur in a “now", but in the hiatus between 2 successive 3-minute-27-seconds “nows”. When then did it occur? We do not have the apparatus to determine this, for we have created a false and illogical time narrative that involves not just inconsistencies but contradictions. By interjecting 3-minutes-27-seconds between successive “nows” we have superseded the model of time and, of course, of the notion of a clock which was ticking between, and enumerating those 3-minutes-27-second “nows”. What logically holds true for the concept “now” equally holds true for every other category of re-interpreted time. If, for example, we reinterpret “before” as preceding “now” by 2-minutes-17-seconds, we face the same conundrum. It devolves through every other permuation of re-interpreted time until we can have no coherent discourse or discussion involving temporal characteristics. This is to say that we cannot have a discussion in which anything is spoken, for “spoken” is the past tense of the present tense “speak”. In a word, all discourse is inescapably temporal. It occurs or had occurred or will occur. We cannot say a lot in 2-minutes-17-seconds which, by this reasoning, would qualify it as speaking “now”. Moreover, when the 2-minutes-17-seconds are up, how are they differentiated from the “following” or “previous” 2-minutes-17-seconds? Is there a hiatus between the “previous” 2-minutes-17-seconds and the “following” 2-minutes-17-seconds? What is its duration? And what can — for something must — occur within it? How then, shall we speak of it? Once specific determinacy is predicated of temporal concepts they lose all coherence. You may say, “Well, a clock enumerates 60 seconds for each minute and 60 minutes for each hour, and so on — so there is a specific and determinate time frame.” Yes … for atomic clocks and the like (which are arbitrarily and artificially divided to begin with — why, for example, 60 seconds for a minute and not 136, and what is the specific duration of a second that is not already arbitrarily based on the present caesium model (“The second is the duration of 9 192 631 770 periods of the radiation corresponding to the transition between the two hyperfine levels of the ground state of the caesium 133 atom.” The International System of Units ) that is in itself a qualified model. 2 Would the same numeric values hold true if the model were based on barium?) In other words, this may hold true for certain atomic clocks, but not for concepts. All this has been a rather long and roundabout way of demonstrating the most important fact that pertains to Catholics: that “forever” as it pertains to time is not a finite quantum, but means, as it has always meant, and will always be understood to mean: "uninterrupted continuity without end". This pertains to Heaven and it pertains to Hell. Therefore it intrinsically pertains to Christian Doctrine. If either Heaven or Hell are merely 399 years, 9 months, and 11 days, the question naturally arises: what happens after that? As we see ,we cannot escape the notion of “forever” without logical inconsistency — and if Quo Primum states “forever” concerning the way we celebrate Mass, it was a definitive, unambiguous, and unimpeachable statement that clarified, once and for all, the manner in which the Mass was, is, and always will be celebrated — forever. Even popes cannot change the nature of time and the consistency of logic. 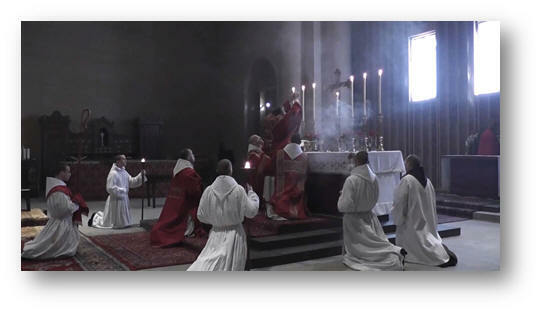 Quo Primum and the traditional Latin Mass prior to its enervation (or evisceration: you choose, for both apply) following Vatican II, remains binding upon all Catholics (read Quo primum which follows) — forever. It is inescapable. Pope Saint Pius V forever bound every successor to the Chair of Peter to it, together with every Catholic. The extremely frightening question that follows is ineluctable: what does this mean concerning the validity of virtually every Mass “celebrated” since Vatican II? If we can prescind from an authentic Apostolic Constitution that binds us forever to the Mass as it was celebrated prior to 1962, from what else are we prepared to illicitly dispense with in the way of the Deposit of the Faith and authentic historical Catholic dogma? We already see it unfolding before us, especially under the papacy of Francis among those who deplore a “throw away culture” but appear to embrace a “throw away” Church. Somewhere in every part of the world the authentic Latin Mass is being celebrated; many under conditions similar to the underground Church in China, and the only difference is that those who police and brutally suppress these recalcitrant congregations outside of atheistic China are the heavy-handed bishops of the Church itself — many of whom appear to have lost the Faith — but not the comfort and perquisites of their office.